Yeah, I chose purigen as a water scrubber as opposed to phosphate/ammonia. Granted, my numbers are all 0 all around, especially because of two filters and how many plants I have, but I just chose it (and referenced it) because it was the best thing I could find for water polishing itself (making it seem as clear as air). I was considering chemipure (and i think another one), but the reuse of the purigen I found to be the most economical. I am using it in both the canister filters. Yeah, our tank requires nothing except the addition of occasionally heated distilled water and flake fish food. The biowheel has to be the greatest possible thing ever invented for casual freshwater tank owners. We have nothing in there but statuary and the pleco just picks up any leftovers. Tank chemistry has been so constant we quit buying test kits years back and the wheel dumps a ton of oxygen into the water, so we can use distilled just pouring over the top instead of an aerator from the bottom. Hardly ever have to change the filter with so few fish, and they're about as active as you'd expect several year old comfortable schooling freshwater fish to be. What have you done with regards to freshwater fish before? One of our major concerns has been the chlorine in the tap water, so even just rinsing off a charcoal filter can be problematic. I'd love to get into more stuff with fish but I'm far into easymode just due to lack of time. I'd love to see some more pics of your stuff if you feel like it. my job is stressful and fish, moving or not, are calming. I'll come back to this, but answer your question briefly. I typically get ro water from one of those water dispensers you find in front of convenience and grocery stores. I think mine is called glacier water. I make sure to go the day or two after it has been serviced. I also use Seachem Prime* to treat my tap water. In the past I've had success with the API water conditioner. It is sometimes easier to measure, but i use an infant medicine syringe for the micro drops Prime needs for my WCs. Typically, what I do, is after the tank is very well established, I only water change if numbers are off, or I notice something stall (growth of any organism, some sort of a reaction, algae bloom, etc). I water change with treated tap water, after it has sat for a couple days (in a 5 gallon HD bucket). Every other day, I top off the tank for the evaporated water loss with the RO water. I never do more than a 25% water change unless something is really off. When I do the water change, I pull all the filter media and rinse it in that old water. I dunk it, swish it and put it back in. This will not damage the filter. Last edited by Tinthalas Tigris; May 12th, 2016 at 01:22 PM. I love the simplicity of hang on back (HOB) filters, but after finally switching to canister, I'll probably never go back. They are a chore to clean, but virtually silent and potentially invisible. I have a tank in my classroom at school. I've often wondered about live plants. Do they get overgrown? How do you manage them? Are the wastes from the fish enough to feed the plants? How do you control algae without killing the plants? I know that there are types of fish that eat algae but every time I get them they never seem to be able to get the job done and the tank becomes overrun anyway (and yes, the tank is not in direct sunlight unless one of the janitors leaves the blinds open during the summer. Overgrown? Sometimes. In fact, yes. "carpetting plants" sometimes require the most maintenance. 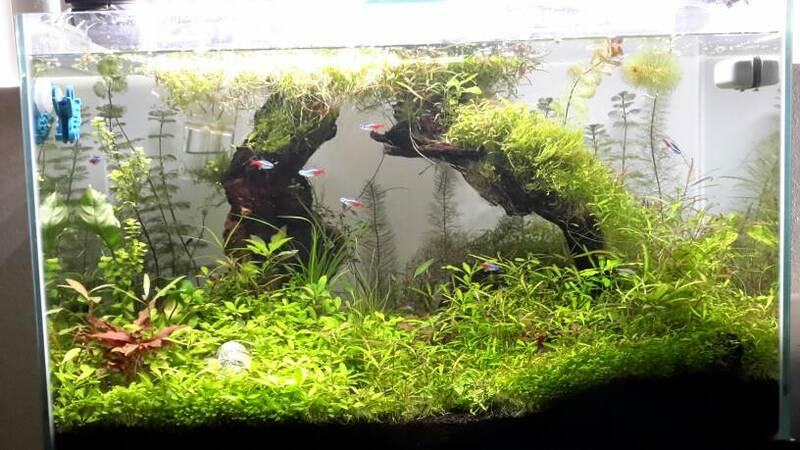 Generally, flame moss, dwarf baby tears (hemianthus callitrichoides), japanese hairgrass (i forget the species name) require the lesst maintenance clippings and are also the most expensive. A carpet made out of Cryptocoryne Parva is one of the easiest to maintain but can get extremely expensive for initial cost to get put into the tank. There are less expensive carpets that take off easily, but naturally, require the most upkeep. Giving Supplemental carbon/co2 will increase growth rate, so it can be done initially and then cut out almost completely once desired growth has been established. Crypto parva will melt if you dont keep the carbon in there, though. Trimming is best done with curved aquarium scissors and/or small stainless steel nail scissors. Get a pair of shoulder length nitrile gloves from Atlas, and your possible OCD from washing hands wont get the better of you. Wastes from a well stocked tank can feed your plants. Eventually the biological nitrogen cycle will get you to nitrate absorption from plants, but you wont get direct potassium or iron (next most important). Driftwood will get you some minerals, and a good quality substrate will get you there (initially) as well. NiloCG sells the most heralded mix of Estimated Index fertilization chemicals in the easiest to use form, per the guidelines of tom barr (arguably, most popular planted tank voice in the world), who invented the EI criteria. Generally, under fertilization is considered wiser than over fertilization, which the latter will eventually lead to algae. Algae is best fought with a patient game of slight modifications while dialing in a perfect balance of light, ferts and co2 (or liquid carbon). They all are part of the formula for creating as well as eradicating algae. For a great book, the planted aquarium by walsteid (i might need to fix this later) talks in great detail about fixing this. The most common culprit in excessive algae growth is too much light. The easiest fix is breaking up the photo period. Instead of 12h on and 12h off, mimicry of tropical photo period is wise. Tropics often have mid day overcast, and easiest implementation is 5 hours on, 3 hours off, 4 hours on, 12 hours off. Algae needs about 6 solid hour if light to not only sustain, but also to grow. Algae is not always a bad thing, though. Some species, including tetras (which is not considered a bonafide algae eater) require a little bit of it in their diet. A tiny bit of it on rock or driftwood can be a good thing. So, what algae eaters to get? Depending on the other inhabitants and tank size, the best ones from least difficult conditions to most difficult is tricky. Ill try simply. Otocinclus (hands down, easiest, most efficient, and potentially the cutest. Must and absolutely should be kept in schools of 5 or more, no matter what. Their procurement from the wild is their only current means of entry into sale for the hobby. Nearly impossible to captively breed, while not unheard of is financially and logistically very difficult, seconded by their just as frustrating extraction from the wild; if you need 5, buy 12. 1 out of every 3 will absolutely perish within 2 weeks. 1 out of every 4 within 2 months. After that, they will retain their normal mortality. The industry can only successfully catch them by nearly bringing the school to death with the use of cyanide (fucked, but it happens). These critters eat almost all algae. Plecostomus: personally not a fan, they grow too huge - the ones that eat the algae that you want them, anyway. They potentially need a tank 55+ gallons. I recommend staying away from them. "True" siamese algae eaters: both difficult to find as well as differentiate between "false" siamese algae eaters. Both eat algae in their juvenile stage and not until they reach adulthood, when the "false" turns into an agressive carnivore will the unknowing learn which one they possess. Amano shrimp: second best choice, but annoyingly aggressive. Seldom if ever cause deaths to other organisms in the tank, but will steal food from other tank mates if you are forcefully starving them in order to make them eat algae. They will also grow comfortable with their bullish nature against tank mates and steal their food even if they have plenty of algae to eat. This can be amusing to watch, but frustrating if they decise to not eat the algae and "hold out" until you feed other tank mates. Red Cherry Shrimp (neocaridina davidi/Heteropoda): Hardy shrimp from taiwan. They com in amazing coloratinos that in the past 5 years have gone from only red and brown varities to Green, Red and Blue, Deep Blue, Blue Velvet, Painted Fire, Bloody Mary, and a whole mix of them in between including patterns called "Rilli" and more. These eat algae, but not nearly as well as Amanos and Short Nose. They are best when placed into a tank that is slightly established, and has gone through its first algae bloom and die off. They will then eat all the small biofilms that will otherwise lead to algae. But once you have real algae, they will not be able to fight it properly. They are more of an algae prevention force, and are beautiful to watch on their own. and Crystal Red Shrimp (Caridina Cantonensis): These are, honestly, my favorite of the shrimps to work with. They are teeny tiny shrimp that over the past 15 years have gone from caught in the wild, to bred so specificially into genetic strains that their particular colorations that can be had will breed only with eachother. Patterns like Orange Eyed Blue Tiger, Crystal Black, Black King Kong (wild looking), Blue Bolt and others are truly amazing. These will not live with any fish that can swallow them. They are tasty, and ussually need to be in a tank on their own, but with plenty of foliage to hide in, they can sometimes live with smaller mouthed fish like neon tetras, and some gobies, as well as otocinclus and some corydoras. YMMV, but if you choose these, expect to spend some money. Less desireable varities such as teh Crystal Red, and Crystal Black, or "mischlings" can be had for less than $10 a shrimp, but in 2008, the very first true-breeding pair (offspring coming out the same as parents) of Black King Kong sold on ebay for $3500. As other strains which prove to breed true arise from the wilds of aquarium hobbyists, they also approach as high a price tag. They are fun, in and of themselves, and their tininess makes them great for small 1 - 3 gallon enclosures on their own. Like the Neocaridina Heteropoda, they do best as prevention against algae by eating biofilm before it becomes a problem. Horned Nerite Snails: These are actually saltwater snails which come in through tides and then can live in estuary like situations of fresh and brackish water in the wild, but because of this are brought into FW aquariums bcause of how efficiently they eat algae. Because they are SW species, their eggs only hatch in SW, and will not explode their populations in a FW tank. What you See is What you Get when it comes to Nerites. If you buy 3, you will only have 3, and no more. Sometimes you will notice the eggs on the glass. For this species, they will keep a tank clean (And get rid of algae problems) at a rate of 1 - 3 snails per 7 gallons. For a 29 gallon tank, i have 2. I could have up to 10 and I would be fine, but I like to have a little bit of scarcity for organisms in my tanks so that I am surprised when I see them. THe two that I have, I see them almost all the time as they are constantly eating algae and algae micro-organisms. THey leave plants, themselves, alone. Can I get a tl;dr version of your dissertation. There is a kitchen with a pot and a kettle in it, and they're both the same color. Last edited by Tinthalas Tigris; May 29th, 2016 at 09:36 PM. No corydoras Tinth? The bronzes are so hardy and fun to watch. Commonly referred to as the hippy fish. I never had success with clown loaches and back in the day they were costly and rare. Khulis on the other hand ...omg love to have one. My first got nicknamed Mac the Knife by my mother because it would glide along the four sides in an undulating fashion and then come to rest on the bottom protrusion of my thermometer in the front and hang in an upside down smile. When I got two twenties cheap while I was married I had one for me that was tropical and my son had gold fish. He was totally captivated by the khuli loach and called it his snake. It didn't have the character Mac did, but it was still fun to watch. Danios in particular the zebra really liven up a community tank too. Very hardy, they school together and active! I always preferred the cardinals to the neon tetras, but the neons do tend to be hardier. I wonder why no live bearers? They're good community fish. You need a 3:1 female/male ration for the sanity of the womenz but you get the added benefit of live food occasionally for everyone unless you provide cover for the babies in which case you restock or share with others. Tinth I'm surprised you managed to kill so many female Siamese. They're incredibly hardy fish. Well the males even more so though of course you have the issue of them challenging any fellow male and even they're own image in the glass. I tried breeding them and just never got the environment right to suit the male to nest I guess. Not sure if it was chemical, to much flow or the tank just wasn't big enough ... back then there wasn't a lot of info on breeding them. BTW, I haven't commented on the other threads but I've read it all with interest and am poring through that book. I call it my dream book. I know what I'd like to build but the money .... yikes! Not sure why, but I'd go with a smaller tank and least demanding fish. It's the corals, crustaceans and the idea of a self sustaining reef environment that gets my juices flowing. I'd also like to find a balanced growing plants and herbivore fish balance that needs little maintenance. A man can dream eh? No corydoras Tinth? The bronzes are so hardy and fun to watch. Commonly referred to as the hippy fish. I don't have anything against corys. There are so many of them, that if I chose to get them I would probably want a very unique variety, like a Sterba. In general, my bottom feeders come from alternate species, especially in the form of inverts. I never had success with clown loaches and back in the day they were costly and rare. Khulis on the other hand ...omg love to have one. My first got nicknamed Mac the Knife by my mother because it would glide along the four sides in an undulating fashion and then come to rest on the bottom protrusion of my thermometer in the front and hang in an upside down smile. I've had one Kuhli. It went into the tank, almost 6 inches long, dug into the gravel, and I never saw it again. To this day, I truly do not know what happened to it. I am a huge fan of Yoyo loaches. If I ever do another tank that doesn't have shrimp in it, it will definitely have another Yoyo (pakistani) loach. Those things are awesome; that or a panda loach. I had some mollies for a brief period. They are a bit too fast for me. I don't have anything against live bearers. They eat shrimp though, so they don't go good in my style of planted tanks. They were my first fish, and I learned everything about tanks with them at a time from knowing absolutely nothing. I am waiting for the right looking fish for me to buy one again. I've got a couple tanks in mind for one, and breeding them is a hilariously fun experience. If I chose to go that route, I would need a place to distribute them, or otherwise feed the fry to my other tanks (which isn't necessarily a problem, it just seems a little evil). The main thing that killed them all was the parisitic worm that we got from the LFS that we no longer go to for anything. Yeah, the money I spent on this very first reef is about $700 total. That doesn't include any of the livestock. After I dial everything in and truly learn it all, I'm going to try a couple pico jars, and go from there. Yes. This first tank will be 28 gallons. I plan on learning as much from it as possible, and then building a couple pico tanks around the house, and stocking them with SoCal reef fish (the ones that are found off the coast of Catalina Island, the Sea of Cortez, and the like). These picos will end up being about 3 gallons top, each. Last edited by Tinthalas Tigris; May 30th, 2016 at 05:12 PM. Pulled the "glossostigma" and "hemianthus callitriochides" and replaced them with crypto parva, staurogyne repens and dwarf hair grass. Took out all the rocks. I think this setup, while it will take about a month or two in order to fill in, will be much easier to maintain than the ridiculous upkeep those fake HC and GE gave me. My bamboo shrimp died today. He was stiff as a board, for some reason. Last edited by Tinthalas Tigris; June 12th, 2016 at 10:49 AM. I have two berried cbs females, now. Time, definitely, to cover some filter intakes. Ouch! My big problem was the escapees I'd find shriveled up behind the tank and on the floor. Live bearers were the worst, but many a zebra danio eloped. Yeah, we had multiple types of fish that used to rocket from the bottom left-front corner of the tank to the top back-right and launch themselves out of the hole that the temperature probe was in on a regular basis. One of them made it 15 feet away from the tank in a single leap, which is pretty impressive for a tetra that landed on carpet and therefore couldn't flop farther. We finally ended up creatively taping the holes in the lid so they couldn't get out, and using smaller pieces of tape with the slick side facing on the inside so they couldn't stick to the tape, either. If I had it to do over again, I'd park a tank near where they were landing and see if any made it. I'd love to study what was motivating that behavior.